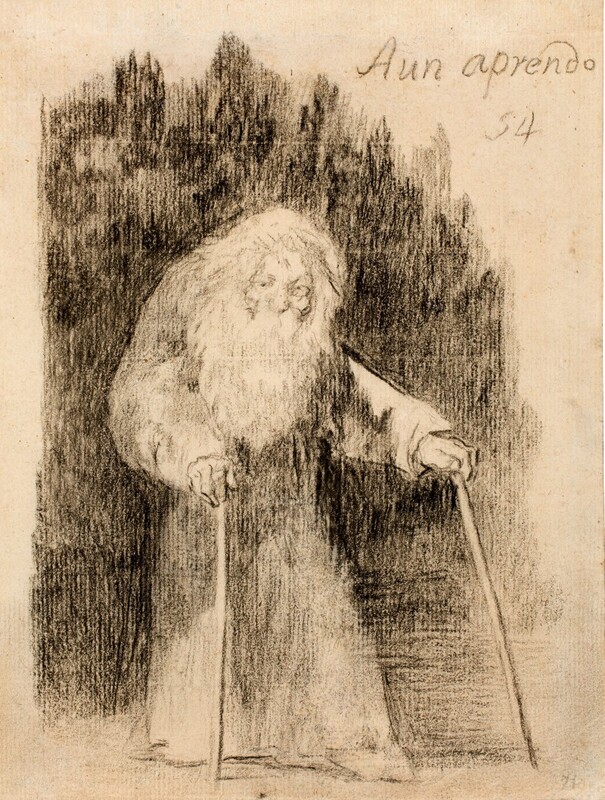 Francisco de Goya drew ‘Aun aprendo’ when he was 80 years old. ‘Still Learning’ is one of his greatest works. It reveals an old man bent over, needing two canes to walk. His head is up and he is moving forward. He hasn’t stopped and shows no signs of giving up. Some of you have been waiting for me to resolve the anger churning inside me. Some want me to get to the other side of this craziness and share what I’ve learned from it all. Maybe it’s uncomfortable for some to be in the midst of such visible turmoil. Some of you have wanted to help alleviate my discontent. I appreciate your concern and your desire to ‘help.’ I do. I get it. I have always wanted to help others in pain feel more comfortable. I have spent my life comforting others and believe I have a good sense of how to help. And I won’t stop being there for others. What is different now is the realization that I don’t want help. I like what’s happening to me. I am discovering this wildness swirling around inside me is leading me to truth. This craziness that is spinning me almost out of control is the force that is waking me up. I won’t accept that ‘this too shall pass’ and I’ll get back to ‘normal’ soon. I want this anger and intensity to be my new normal. I want this vital energy that I have kept the lid on for so many years to be the fuel that ignites the rest of my life. Like Goya, I want to keep learning and loving with the fullness and intensity of the sun and burn out at the end of my life leaving this world in a swirl. Excruciating. That’s what my life has been. Excruciating. Excruciatingly painful. Excruciatingly beautiful. Excruciatingly healing. There is so much intensity I have felt my entire life simply through the act of living. At times I wished I was a la-di-da, happy-go-lucky type of person where everything seems to ‘role off their back.’ I’m not. I’m not a ‘happy-go-lucky’ person. I feel things. I feel everything and I feel it all very deeply. This anger and intensity I am revealing now has always been there. I’ve kept it hidden behind a mask, the mask of sweet Melody. As I let go of this mask and feel the fullness of the rage within me I am beginning to understand the power it contains. It is a life force. It is the life force for my growth. I don’t want this force to pass. I don’t want this storm to weaken. I am beginning to come alive and be more of who I truly am. And, I am beginning to feel the sheer power of the love that is inside me. People are often uncomfortable with power and yet it is the fuel that ignites our desire to grow and change and become. Without this powerful longing we stay the same. We stop the natural process of evolution and end up living in a quiet despair reaching for a bottle, a conversation, a store, the internet or any other number of substitutions for living one’s truth. I won’t settle down and wait for this storm to pass. I am the storm and the rainbow and the new growth coming. I will ride this storm like a wild horse and hold on tight to the powerful neck of this beast and say more….MORE…. MORE! Don’t stop this wild ride. I am here! I am soaring through this excruciatingly beautiful world full of wonder, aliveness and truth and won’t stop until there is nothing more to learn and live through, and I accept all the pain, heartbreak and fear that comes with living life to the bones. I will not be on the surface of things. I choose to dig down to the core and search for what is real, what is true, what wants to be seen and discovered. I will bear the excruciating pain that comes with living in the light of truth. I will continue to learn to be the lover of my self that is willing to give everything to grow, to become, to live with all of me and never abandon myself again.